A man who killed a father-of-one by punching him to the ground and kicking and punching him, has been jailed for nine years. 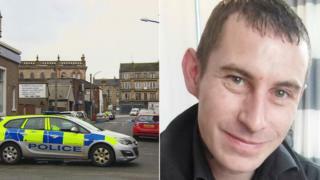 Jamie Anderson, 36, caused the death of Paul Mathieson in Renfrew in 2018. Anderson was caught by his distinctive Nike trainers after a painstaking five-month investigation. The rear flash of the shoes was caught on CCTV and the victim's DNA discovered on them when Anderson's home was searched. This produced a list of 22 suspects, including Anderson, of Bank Street, Paisley. When police searched Anderson's home and examined the clothes and shoes he was wearing that night, DNA was found on the stitching and welt of the right trainer. At the High Court in Glasgow, Anderson admitted killing 37-year-old Mr Mathieson, from Renfrew. He punched him on the head, causing him to fall to the ground and then kicked and punched him on the head and neck at Houston Street, Renfrew, on 14 January last year. Mr Mathieson died from his injuries at the Queen Elizabeth Hospital, Glasgow, six days later. Anderson was originally charged with murder but prosecutor Jane Farquharson QC accepted his guilty plea to a reduced charge of culpable homicide. CCTV played in court showed Mr Mathieson, who was carrying a pizza box, and his killer embracing and going their separate ways. But, seconds later Mr Mathieson put down his pizza box and Anderson thought he was going to attack him. Anderson knocked Mr Mathieson to the ground and then as he lay there helpless, kicked and punched him before walking off. Miss Farquharson said: "Mr Mathieson has been described as volatile and verbally aggressive when under the influence of alcohol." The court heard that at different times the two men had dated Gillian Carswell. Defence QC John Scullion said: "The two men met for the first time a few days prior to this incident. It became clear they had both been involved in a relationship with Miss Carswell. She had a history of playing partners off against one another and there appears to have been an element of this. The court heard the cause of Mr Mathieson's death was blunt force trauma to the head and neck. Judge Lord Arthurson told Anderson: "The loss to Mr Mathieson's family will be severe and long-lasting." Anderson showed no emotion as he was led away to begin his sentence.